A wireless headset with superior Active Noise Cancellation for office noise and integrated busylight to enhance productivity. Can I use the Evolve 75 with my smartphone and tablet? Yes. You can connect your headset to your PC with the Jabra Link 370, and a mobile phone at the same time. Can I stream music to this device? Yes. Evolve 75 has world-class speakers that are built for both voice and music. Can I pair this with iPhone and Android? Yes. The first time you turn on your Jabra Evolve 75, it is ready to pair with your mobile phone. Does it work with Mac and PC? Yes. It works with both systems. Does the usb dongle come with the headset? Yes, it is supplied with the Jabra Link 370. What is the wireless range from my laptop? If you use the USB adapter provided in the box, you will get up to 100ft / 30 meters of wireless range from your laptop whilst on a softphone call or listening to music. How do I charge the headset? You can use the USB cord provided in the box to connect to your laptop power to recharge, or you can purchase a separate charging stand. What is the difference between UC models and models that are certified for Microsoft Skype for Business? The models that are certified for Microsoft Skype for Business (Lync), support Microsoft Skype for Business in Plug and Play mode. These models support features to answer and end calls, adjust volume, and mute. If you are not using Microsoft Skype for Business, use the standard UC model. For the UC model please see Jabra Direct or Jabra Suite for Mac for fully supported softphones. Does it have a 3.5 mm jack? No. Evolve headsets that include a 3.5mm jack: Evolve 30, Evolve 40, Evolve 80. 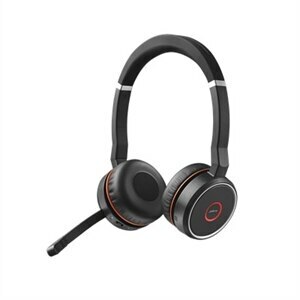 Jabra Evolve 75 is a great wireless headset for concentration in the open office. You can switch on active noise cancellation to virtually eliminate low-frequency sounds, like the hum of air conditioning. The high-quality speakers and HD voice ensure crystal-clear calls and music.